If you Google "green landscape painting" you'll find two types of images: ones where the artist has struggled with the colors, and ones where the artist has clearly found a better approach. For most of the history of people creating art the color green has been treated with a great deal of trepidation and a quick browse through these images will show you why. 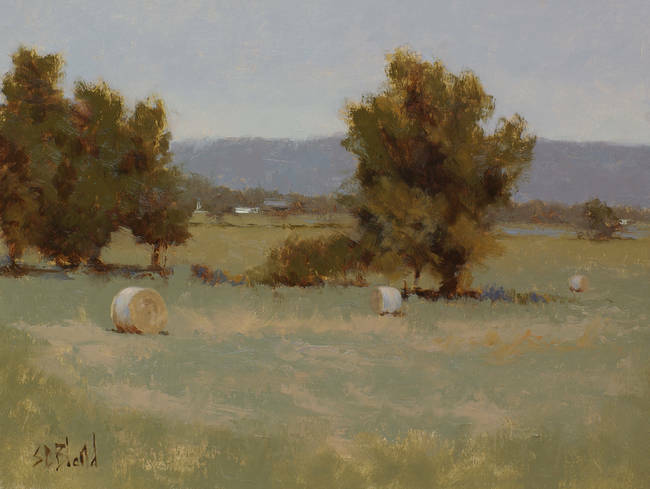 In this blog post I show some ways to paint landscapes without using out-of-the-tube greens and some strategies for using greens more effectively. The suggestions I've provided can be applied to any style of painting. When we first collide with nature as an artist, we soon learn that the landscape is not how we imagine it to be from the safety of our studio. All this green is a problem: it can be the most intense color in the landscape and also one of the darkest, in fact our ability to see variations in green far exceeds our ability to create it in paint. I struggled with this as much as everyone does. An obvious solution is just to paint something else, yet I've been to many locations where green was inescapable—on an overcast spring day it seems to permeate the air. I realized that I needed to meet the problem head-on and find ways to deal with it. At this point in a typical "how to" article you might be met with advice like "if you see color so-and-so, paint it like this....", but for our purposes that isn't enough. To master this problem you need a good strategy, and for that you first need to think carefully about intent. What are you trying to achieve with any given painting? For me, the most important thing (usually) is to capture the experience of being at a location. I want to create interesting paintings with good color harmony but I'm not terribly bothered about whether or not they look like an actual place. I'm more concerned with the light and the value relationships than I am with reproducing colors. Understanding all that helps me when I start a landscape painting. It makes the "green problem" easier because I don't feel the need to make an exact copy of what's in front of me. I always have the freedom to create my own interpretation of a scene. Although your first instinct might be to attack the salad bowl of vegetation with an array of exotic tube greens, it turns out that they don't help in making sense of the madness. They get in the way of reducing the color intensity and, since we use them mainly in one part of a painting, they make it hard to achieve good color unity. The best solution is to mix your greens. This may require you to rethink the colors on your palette. And mixing greens in the field takes a lot of planning and thought—don't just reach for the nearest blue and yellow. I struggled in my first few years of plein air painting until I stopped trying to shoehorn viridian + cad yellow and ultramarine blue + cad yellow into every painting. When I added chromatic black and some paler blues, the new color combinations worked much better for the types of painting I wanted to create. Mixing violet gray and lemon yellow created a green unlike any other I'd tried. Slightly transparent and gray, it was a good foundation on which to build this little on-location sketch. By the way, I added those same two colors to all other parts of the painting. It's a natural step to take this way of thinking one step further and to start working with a more restricted palette of colors. Once armed with some colors that make a useful green, just a handful of extras should be enough to get you through most landscape paintings. I think of a "limited palette" as being five or fewer colors. In the example below I worked with a total of three. The benefit of a limited palette is that it makes choices much easier so you can focus more on getting the right values. It forces you to compromise. Using it in the field requires you to plan out the painting in advance, but no more than you would with any other approach. On the other hand, when you're on location it's easy to break up large areas of green with other colors. It doesn't require much planning out and you can easily make adjustments as you go. It's also a useful way to rescue a painting when you realize you've over-used a particular color. 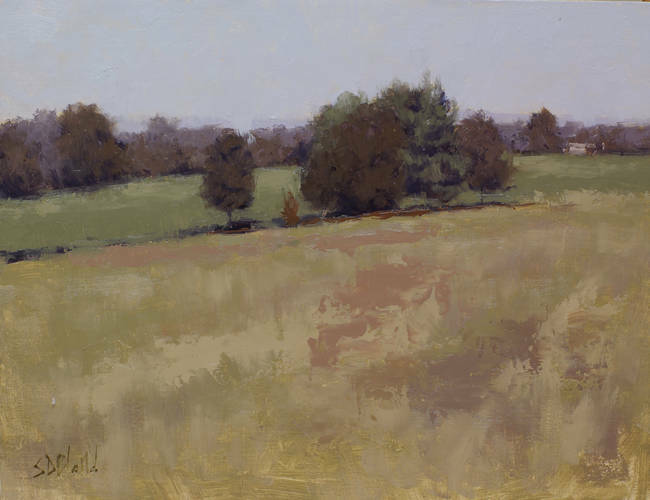 In this plein air study I made the greens less intense as they receded into the distance. I let the orange block-in show through in places to break up the green mass and I put violet over the green in order to temper the chroma. Adding some violet and/or orange notes breaks up this area because they are split complementary colors of green (opposite on the color wheel then one step clockwise and counter-clockwise). However, that's still a lot of bright green in one painting. Keep reading and we'll look at some other ways to make the painting less monotonous. We're now going to take the breaking up of areas a step further. Instead of treating the ground as one single thing, let's break it up into a distinct foreground and middleground. In the painting below I divided up the field in just this way: I replaced the bright foreground greens with a mix of earthy colors and I made the middleground a cool green. Just as in the previous example, these got broken up with different colors. 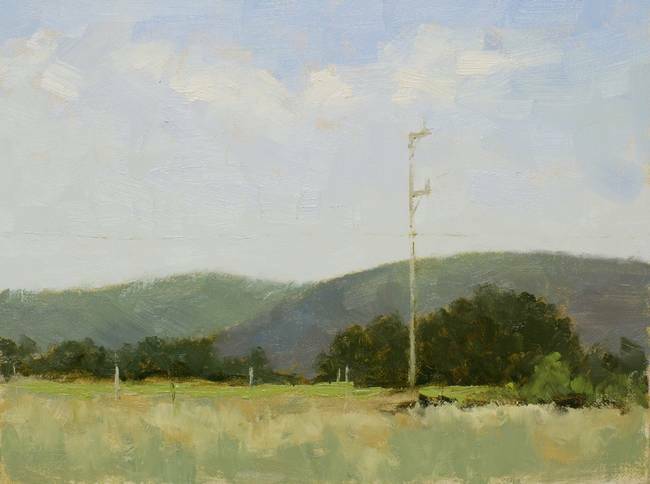 The advantage I had in this painting was that it was done in the studio from a plein air study. That gave me much more time to re-compose it, adjust the color scheme and avoid repeating my mistakes. Here's a photograph of the painting location. You can compare the two images to get an idea of the changes I made to the colors. Because our eyes are so highly attuned to green, it can be very effective to hold back and only use it sparingly in areas of importance, such as near the center of interest. At this location I searched for a long time to find something that wasn't overwhelmingly green (I'm not always so fortunate). I toned down the chroma of the long grass in the foreground and only used bright green in a horizontal stripe in the middle ground. In this instance some yellow might have worked equally as well as the bright green. You can often substitute one for the other. Out-of-the-tube greens often work best in the foreground. I think the reason is that it supports the idea that the intensity of colors falls off as things recede into the distance. It's the reverse of atmospheric perspective in distant objects. This also works, I suspect, because the viewer tends to overlook them and focuses on the more interesting stuff in the middle ground. After all, we don't see much color with our peripheral vision. In the painting below I used a Winsor and Newton color called "Green Gold" mixed with white for the most intense greens. I also broke up the area with browns and violets. Colors appear more vivid when they are close, so bright greens in the foreground can add depth. To be honest, I'm very wary of this bright green. I've used it successfully in two small paintings, yet I've used up most of the tube. That should give you an idea of how many failures it has caused. I keep it locked away, along with the cad yellow deep, in my palette box where it's hard to get to. 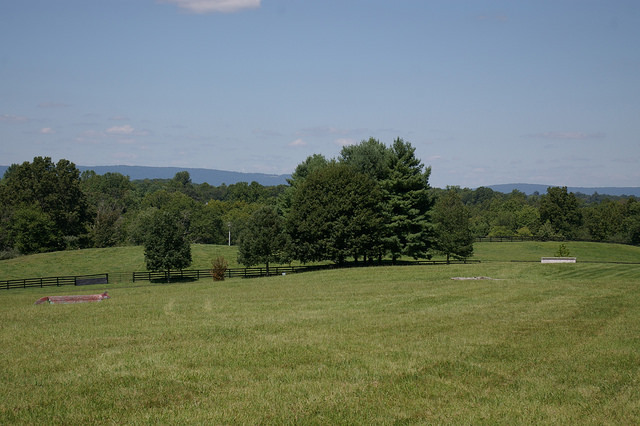 The landscape eventually provides its own solution to the green problem. As the summer wears on, grass grows and seed heads form. Summer drought brings relief in the form of oranges and pale browns, and you can eliminate green almost entirely from the painting yet still create something that's true to life. Avoiding green altogether sets a tone that's evocative of late summer. 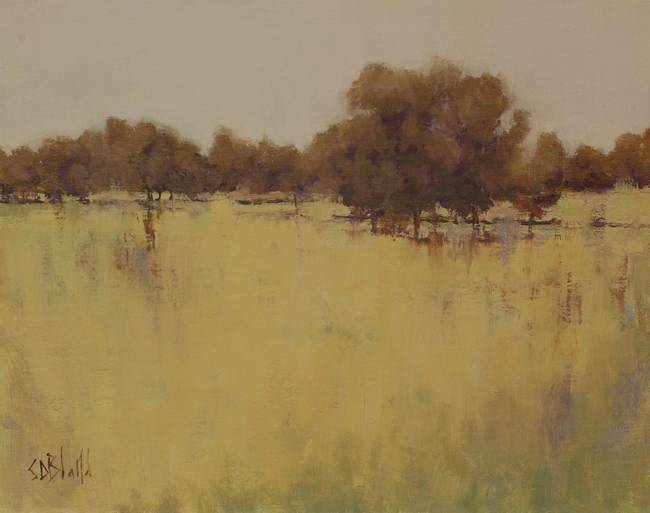 Of course you don't have to wait for this to happen naturally—you can simply alter your photos of green landscapes so that they are easier to paint. Filters that remove any traces of green can be applied to a reference photograph in Photoshop or GIMP (do a Google search on "Free Instagram filters for **your software name**" for some basic stuff to get you started). Of course, this is a technique that's best suited for use in the studio. Trying to work from photos on your phone while on location doesn't make much sense to me. Actually, what I've found is that when you start altering landscapes in the studio so they have less green chroma you'll gain the experience to be able to do it on the fly while painting on location. As spring progresses through summer and autumn, I switch from lemon yellow to cad yellow light then to cad yellow medium. 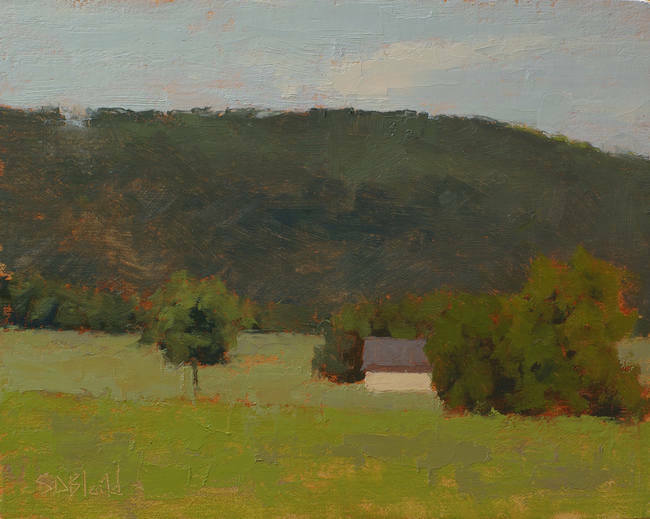 For fall paintings I shift to a warm palette and I deliberately try to avoid muddy browns. Here, I've applied the foreground in a broken texture over a warm block-in. The interesting thing about the "greens" in the foreground is that they they aren't green. There are no greens in the painting. 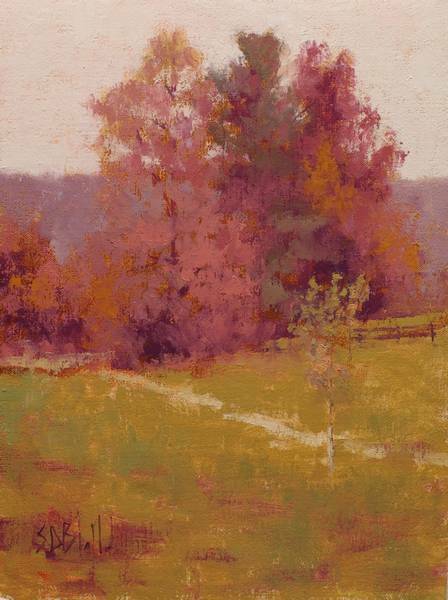 The foreground is created with a range of oranges and the "greens" in the central tree are actually dark red grays. If you don't believe me, here is a sample of the main foreground color so you can see it in isolation. This mind-bending effect is called color-constancy. Your brain is perceiving these colors as green because it knows that's what greens look like under very warm light. To make sure there's no ambiguity about the light color I also made the sky a reddish gray. I saved this example for last because it's the most difficult green-handling technique that I know, but very effective when done right. 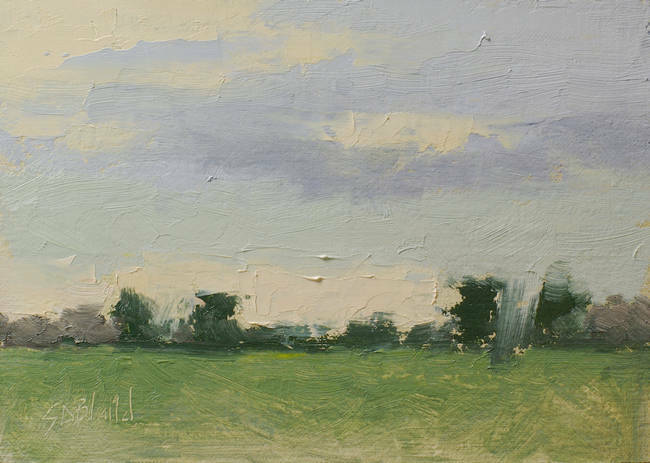 Unfortunately, if I remember correctly, my two favorite landscape painting books "Richard Schmid Paints the Landscape" and "Carlson's Guide to Landscape Painting" don't pay much attention to the subject of greens. 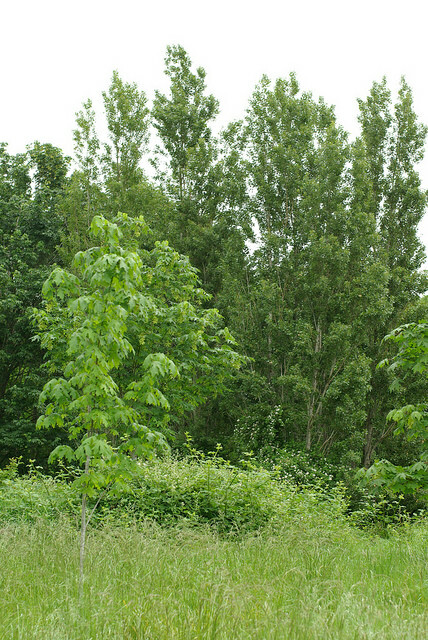 For more reading I recommend this blog post by James Gurney (the comments are also worth reading), two blog posts by Stapleton Kearns, one dealing with summer greens and another on mixing greens, and a final blog post by Terry Miura also on mixing greens. All three of these artists write as well as they paint, and their material is easy and fun to read (my writing is much harder to wade through). If you have any questions don't hesitate to drop me a note via my contact page.